We haven't seen a new Jimny on a club trip before. You'll need to confirm you can attach a rated shackle (or a soft shackle) somewhere strong enough to recover the vehicle. The previous model jimny had poorly designed tie down points which were too small for a rated shackle and failed readily. The tie downs are similar to the old model in position but look like they will accept a larger diameter shackle/pin. If you're getting a tow bar fitted this will take care of the rear. Make sure you have the pin and R clip with you, along with the hitch but ensure you can remove the towball (or remove it before the trip) this will give you a few different options for attaching a strap. For the front, a shackle could be used on the front tiedown with care. Id' recommend purchasing soft shackles instead of rated Bow shackles. It's the way everyone is going because they're safer and more versatile. 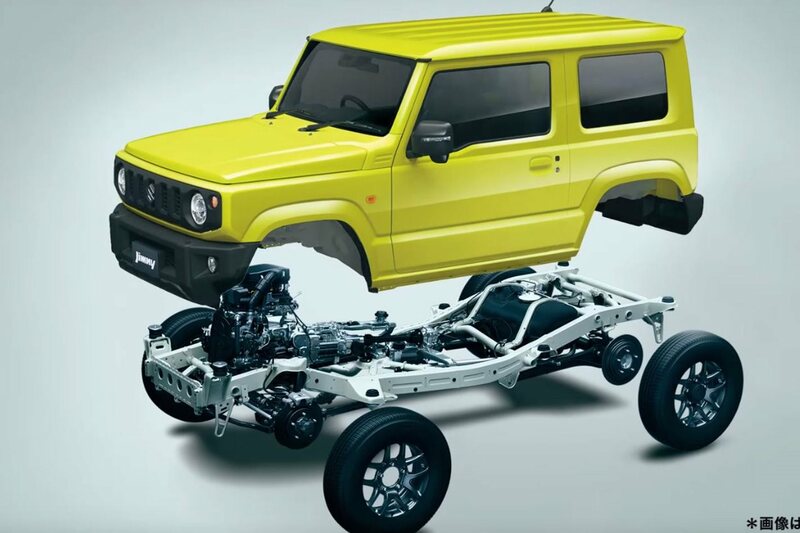 It's unclear to me whether the new Jimny has diff breathers that are extended to above chassis height. Someone on the trip will check this for you before you start. If it doesn't (many new suzukis do) the water depth you can drive though will be limited to the centreline of the hub. This isn't really the place to go over 4WDing theory, but here are a few quick pointers. Drive obstacles as slowly as possible and only as fast as necessary. This might mean you need a few goes with a little more momentum each time. That's fine - when you do make the obstacle you will have done it in the most control. Keep the car in gear if it's a manual - stay away from the clutch unless you are changing gear or setting off. don't ride the clutch or coast the car, especially back down a hill when reversing. Your car has traction control but if it's like other suzukis, it will take a bit of wheelspin before it works. Remember that if you touch the brake the traction control is disabled. It can take a little bit of trust and commitment to wait long enough for the TC to work, especially if you're on a big angle or the car is balancing. This (like everything about 4WDing) is harder with a manual. There is no shame in getting stuck or needing help. This sounds obvious, but the red mist can descend and that's when people make bad decisions. We talk incessantly about "lines" and "picking a line" Picking a line means visualising where the car will be putting it's wheels, and trying to keep the axles level limiting suspension flex, and keeping the vehicle on a safe angle. It's also avoiding ruts/rocks etc which are too big for the vehicle to pass over. The big difference between driving on and off road is that the on road the driver gives almost no thought to the road surface. Off road, the road surface and where you are placing the car on it demands your constant attention. On difficult or technical pieces of track, the convoy will stop and the cars will be moved through one by one. This is when experienced members will act as "spotters" to guide you. Wayne (luigi, the trip leader) and Jon are both experienced long-term club members. They will work together to position you where you need to be to prevent damage/sucessfully drive the obstacle. You need to listen to them and follow their directions exactly when they are spotting you. This isn't something unique to new/inexperienced members. Even long term members with years of experience need to rely on a spotter from time to time, and we all do it for each other. It can, however, be bewildering and disorienting to drive the car exactly as someone standing outside is telling you. Take your time, ask for clarification if something isn't clear, get out and have a look for yourself and talk to the experienced members about where and how they are advising you to drive the car. remember too that the car(s) in front of you won't necessarily take the same line as you, for a number of reasons, sometimes just because the driver wants to have some fun with a more difficult or technical line. Oh, Bacon, can you make it to the club meeting on Wednesday? New Jimny? As in latest model, off the showroom floor? I was wondering the same thing. Speaking from experience, a first trip for a newbie with the Suzuki Club can be a daunting experience. Specially so, if you are in a car you are unfamiliar with. If possible, come to our meeting on Wednesday night, Feb 13, or come to our stand at the 4wd show and have a talk with us. I don't want to discourage you, new people are always welcome on our trips. If you want to learn all about 4wding, you could not have picked a better club. Oh wow. This is awesome, thank you for your very concise reply.! I will have to find out about the tow bars etc. when I pick it up. I presume a 4x4 shop would probably be able to help me select shackles and other items. Yes it is the new Jimny, manual transmission. And yes, I should be able to make it to the meet on Wednesday. I will drive the vehicle in as well. Hope to see some of you there. I presume that is the 4wd Super Centre? Don't buy from them unless you can take the goods right then and there after inspection. Shackles have to be rated and Steve has probably written a page about it on here. I didn't know until I was told. Costlessbolts.com.au is a good place for connecting stuff and usually there is a 4x4 shop around, but best talk to the club on Wed, especially as we can see the new jimny and give advice. I’m not sure I have, directly. Steel shackles do indeed need to be rated bow shackles, however, the prevalence of soft shackles has changed things quite a bit- I wouldn’t advise people buy steel shackles any more. They’re a pain in comparison to soft shackles. Carbon branded product is good stuff and supports a friend of the club, long term ex member and good bloke. Yeap. I intend to do the meet up first, and then see what exactly I need before acquiring them. Look forward to the meet, and I don’t think I’ll be able to sleep tonight.